CBC’s Dragon’s Den star Bruce Croxon has been called a modern-day Renaissance man. Having made his fortune in the tech industry, he turned an eye to the health and wellness sector, opening Vida Spa. The high-end holistic spa now has three downtown Vancouver locations and one at the Fairmont Chateau Whistler. 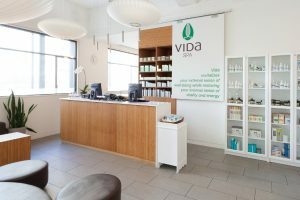 One of the Vida‘s Vancouver-area spas is located inside the YYoga Downtown Flow studio on Burrard Street. “In December 2015, an opportunity came up for us to collaborate with YYoga. We felt it was a great way to provide our guests with an incomparable spa and yoga experience should they want it,” explains Allison Hegedus, president of the Vida Wellness Corporation. This luxurious spa with its warm, inviting and soothing surroundings specializes in highly personalized and customized treatments. Massages, aesthetic services and couples’ treatments are all focused on restoring both the internal and external sense of well being. Facials are particularly popular, with each different treatments designed for specific skin needs: an anti-aging collagen facial is designed to hydrate and tighten skin, while the cleansing and calming facial will appeal to teenage clients struggling with breakouts and acne-prone skin.